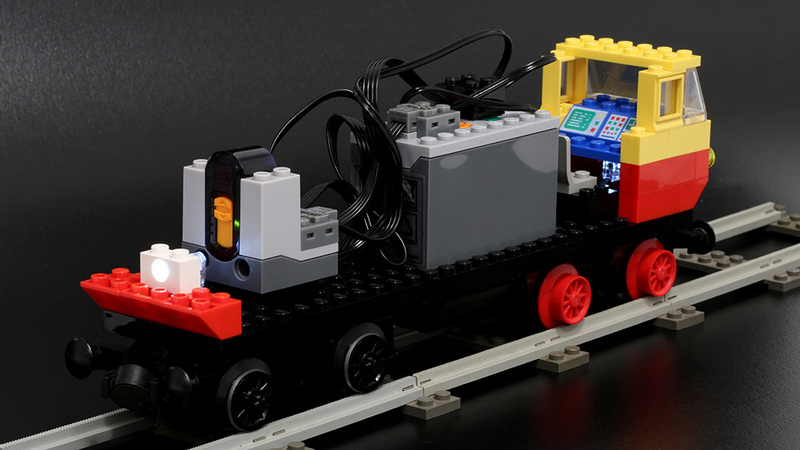 Quest for Inter-City train: A few nights ago I decided to take out my collection of new and old LEGO Trains bricks, as well as my Power Functions (PF) pieces, and toy a little with the locomotive. Run the baseplate with some PF magic. I know many others have successfully Power Functioned the 7740 Inter-City Passenger Train before me, but I decided not to read anyone’s instructions or schematics and just see how I could fit the components in there myself. This was the first time I’ve really paid attention to a regular LEGO train baseplate (all I had as a child was the far smaller 7710 Push-Along Passenger Steam Train), it really struck me how much bigger LEGO Trains based on this baseplate are. In the end, at three train baseplates long, this is going to be a really significant sized set. I did build, some years ago with my son, a similarly-sized 7897 Passenger Train (actually longer thanks to its head and tail pieces) that used a white version of the train baseplate, but I didn’t really pay attention to these things back then. The dark ages can make you ignorant, it seems. As you can see, I also put in just a little of the locomotive front and rear structures to get a sense of things to come. Everything has been designed so that all the outside walls, roof and windows should fit normally, as long as the 2-wide side weights are replaced with 1-wide red bricks (the battery pack provides all the weight needed anyway). I also left room in the front for the driver and his regular front instruments for playability. PF rechargeable battery (AAA battery box would work too) is a little front of the middle point, one stud wide hole left underneath for cabling, which goes to the PF train motor. The PF train motor replaces the original 12V motor in this design and to TLG’s credit, it mimics the shape of the original 12V motor pretty much exactly, fitting right in. Two other PF elements here are the PF infrared receiver, raised by two-high stacks of 1×2 plates, so that the bogie underneath it has room to fit – also the rear light cabling uses this cavity to snuggle through. A single PF light cable splits to both ends, where its light diodes connect to white 1×2 Technic bricks with hole, replacing the original 2×2 light brick design. The infrared receiver connects to the battery pack and the PF train motor and PF lights connect to the infrared receiver, on its red and blue sides respectively, so you can control the motor and lights separately. Originally I attempted to fit the battery pack over the rear wheels, but the bogie peg wouldn’t fit. Raising the battery pack (maybe one plate high) would work there, as long as you make sure the roof still fits, but in the end I decided the infrared receiver would probably be better placed back there. I had pondered putting the infrared receiver in the front for better IR visibility, but thought against it for playability purposes, as the chosen design allows for a driver to peek out from the front window. Somehow I don’t think an IR “robot head” there would feel as welcoming. It remains to be seen if this design works well, IR reception wise. In this “open” form it obviously works very well, but that’s not the final setup. With a roof on, the IR receiver could still be moved one step backwards for better IR visibility from windows. Another idea would also be placing the IR receiver in the middle, so that the eventual middle side windows “see outside” – if it works better that way. This would mean simply reversing the locations of the battery pack and the IR receiver from the current design. As both designs leave the rest of the locomotive as is, it would be trivial to move them to either position later on. Whatever works best. Another future improvement would be trying to see if using a two-holed Technic brick and two PF light cables, with two lights on both ends, would solve the hotspotting shining through the front lights – maybe it would just make it worse. Some tin-foil behind the light prisms might be a better solution. This design could also be interesting in adding even more light brightness (as PF lights are adjustable, it would give a little more range). I will explore this in a future post. By the way, in this setup without walls, roof or the wagons, the train moves really, really fast even at the slowest PF setting. This said, I’m not intending to build this project as a PF train. The intent is still to put that 12V Transformer into actual use. However, as I still lack the 12V motor and the actual black wheels for the train for example, this was just one evening’s little side project to see how I could fit PF in there. Soon I’m stripping out the PF components and start laying in some true-to-1980 brickwork. Let’s close with a little brick math: Most pieces in this rudimentary model are brand new from TLG or regular stores. The only used pieces, all but the light prism setup from my childhood collection, are the old light grey front seat (from 7835 Road Crossing), two computer screens (from 8680 Arctic Rescue Base), two yellow windows (from 6689 Post Station and an unknown other set), the front light prisms/holder (from BrickLink), the train buffers/couplings, temporary red front wheels (from 7710 Push-Along Passenger Steam Train) and, of course, the tracks. Just finished my 7740 PF! It was a scratch 7740 without 12v motor, so, since it is very time consuming to mount 12v tracks (plus wiring) all times, I thought to create a PF version to use with fast-to-build PF tracks. Used double-hole technic 2×2 brick for front and rear lights, I confirm the hotspotting shining is just doubled, but similar to the original 12v one. 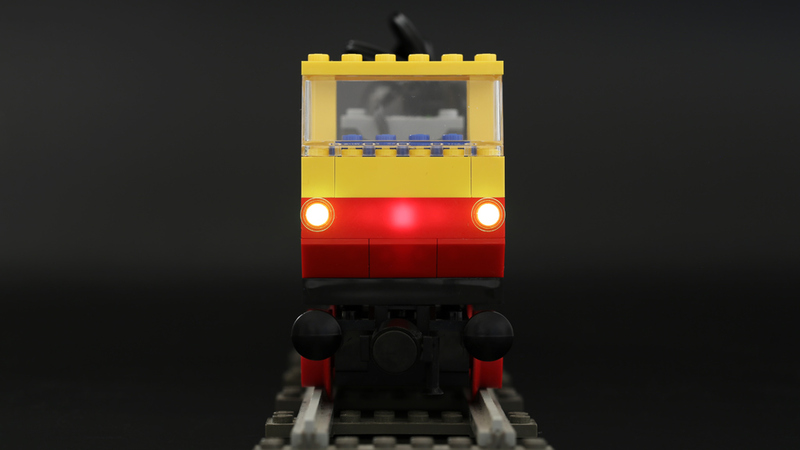 I used white front headlights since the bluish PF led plus yellow 1×1 round bricks creates a greenish light which is not good. I managed to fit the battery over the rear wheels and to keep the two central weights. A small red button between pantographs turns the battery on. PF Receiver is in the front, turned onwards by 90° so the robot head is just pointing to the fron windscreen. It has a PF train motor with 6 original 12V wheels (a simple modification that keeps 12v wheels intact and adds realism and traction – you can even use original 12v coupling rods on steam/diesel locomotives). It pulls its 2 original cars plus 7820 mail car (in 1980 configuration) or 7815 sleeping car and 7819 Mail Car (in 1983 configuration) without effort. Very nice and quite fast on PF tracks and long radius curves! 7725 PF coming soon!